Forcibly separating children from parents and guardians; closing America’s border to aliens of a certain variety; a still unresolved response to natural disasters in Puerto Rico – it appears that if you are “the other” in this country or on your way here – you are going to have a tough go at it. And there appear to be many who agree with this at some level, at least enough to make this an argument. And argue they do. Not me. At least, not so much! We’re in: all of us. In this place of faith we share, we’ve already agreed that it is about love and welcoming and hospitality toward each other and the stranger among us. As one among you, I know we know this, and I know how inadequate love can sometimes feel in the absence of reason. Still, that doesn’t make love weak or impotent, it just means not everyone gets it – yet. In many ways, we are the yet that others are coming to know. It’s why the smallest acts of kindness and compassion are so important. It’s why the occlusion of love in others by anger – calls us to love even more in the all directions and calls we follow. Jesus taught us that love is the answer and that’s the difference. We have it on good authority that love and hospitality are the fundamental tenets of the kin-dom of God. Good News that it is, it also does not mean that everything will get better right away, and in those cases, especially, our loving is critically important. Friends, our challenges in this world are many, including how we enter into dialogue that helps us to engage one another in civil and thoughtful ways. Seeking dialogue to galvanize a loving response in the face of the many injustices that brings us together is critical, while leaving a path for those who are uncertain or oppositional to follow, while we carry on. We cannot be held hostage to those who are not ready to change. We love them, perhaps, most of all. Loving others does not require everyone to love us, first. Seeking change does not require everyone to want the change. It just means that we, who are inclined in the way of love, begin the process anew each day, sometimes several times a day: because we love. Especially now, as we see and seethe with the pain and struggle of others because of our government’s response to their actions, let those who lead feel the full force and heat of the love we have and the faith we share in calling for change. We are always best when we lead from our position of strength: love. Thank you to everyone for your donations. Friends, please support the Marjory Stoneman Douglas High School student organized “March for Our Lives” through this campaign managed by That All May Freely Serve. 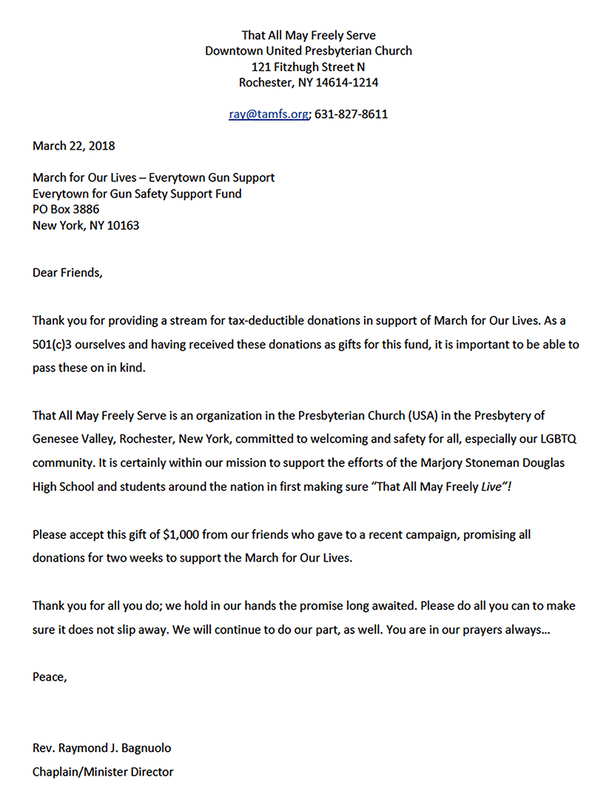 100% of all donations will be submitted to “March for Our Lives” by March 19, 2018 – helping to pay costs for the March on Washington, D.C. on March 24th. will be donated to support the Never Again Movement. Whatever you believe may be the solution to gun violence, we all agree that no student should ever be shot to death in a school or elsewhere, ever! By helping the students of Marjory Stoneman Douglas High School in their movement, we can help to restore the dignity and respect for life that all our beliefs call us to hold without exception. Friends, many of us have worked in movements as activists, advocates and allies. We call on you to now act as all three in supporting these young people from across the country with your financial gift and your individual actions and ongoing prayers. Too many of us know what it is to lose someone to gun violence. In their memory and for all those who look to us for their safety, care and love – please give today. Rev. Ray Bagnuolo, Chaplain and Minister Director of That All May Freely Serve, a ministry of the Presbytery of Genesee Valley, New York with financial oversight provided by Downtown United Presbyterian Church, Rochester, New York. He also serves Sayville Congregational United Church of Christ as pastor. We occasionally send out brief, unobtrusive e-mail messages, and we would love to include you. Sign up below! Copyright © 2019 . Entries (RSS).